1. Steep the saffron strands, if using, in 2 tbsp boiling water. Heat a griddle pan over a high heat. Brush 1 tbsp all over the lamb chops. Cook for 2-3 minutes on each side for medium, transfer to a warmed plate, season and cover with foil to rest. 2. Pulse the cauliflower, parsley and mint in a food processor until finely chopped. Transfer to a large bowl and pour over the saffron water (or 2 tbsp water), lemon zest and juice, and remaining 4 tbsp oil. Add the onion, nuts, pomegranate seeds and apricots; season and toss together. 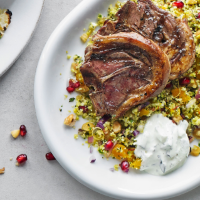 Serve with the chops and a dollop of tzatziki.